Hydrangea is a native North American shrub; the stems, growing from 3-10 feet high, are covered with thin layers of different-colored bark. The opposite, ovate, serrate leaves have hairy veins on the underside when mature. Rounded or globular clusters of small, creamy-white flowers appear during June and July. The flowerheads are surrounded by sterile, papery, flower-like structures that attract bees and other pollinators to the tiny, inconspicuous fertile blooms. Grows on dry slopes, in shady woods, and on streambanks from New York to Iowa, northern Florida, Oklahoma to Indiana, Ohio, and Louisiana. The name “Seven Barks” is applied to the hydrangea due to the seven separate layers of different colored bark. There are 23 species of H. arborenscens, or wild hydrangea. The flowers are colored, depending on the acidity or alkalinity of the soil, mostly white, often tinged with pink, blue, or purple, and in a few are entirely colored. The root bark was formerly marketed under the name “Gravel Root”, referring to its use for kidney stones. Making hydrangeas blue: Hydrangeas are often made to produce blue flowers by adding aluminum sulphate to the soil at the rate of 1/2 lb. to 5 gallons of water at weekly intervals. After 2 or 3 applications, it also seems to help to apply 4 oz. of ferrous sulphate per 5 gallons off water for a few weeks. This treatment is continued as long as it seems necessary to make and keep the soil acid. Making hydrangeas pink: Hydrangeas are often made to produce various shades of pink flowers if they are not grown in acid soil. A neutral or slightly alkaline soil will give the results desired. Add sufficient lime to bring the pH of the soil to a figure somewhat between 6.7 and 7.2. The addition of the lime is best affected by lifting the hydrangea in fall, shaking the roots free of as much soil as is safely possible and then mixing the lime thoroughly with the soil before planting again. To be certain of the amount of lime needed to bring the soil to the required pH figure, have the soil tested. The root has long been used as a mild diuretic. It has a reputation for helping to prevent and remove gravel, gallbladder stones, and kidney stones. Will relieve chronic rheumatism, backache, paralysis, scurvy, and dropsy. Homeopathically, for bronchitis, treats diabetes, incontinence of urine, and prostatic affections. 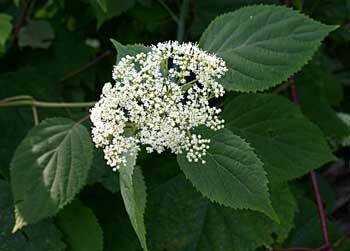 The Cherokee Indians used this herb for urinary retention and stones. Also excellent for chronic penile discharge (non-specific urethritis) in men and mucousal irritation in the aged. This herb acts differently in different people. In some it acts like a laxative. Therefore, it is better to start with a smaller dose and increase slowly as needed. The average dose is 2 capsules a day. Externally, scraped bark is poulticed on wounds, burns, sore muscles, sprains, tumors; the bark chewed for stomach problems, heart trouble. Infusion: steep 1 tsp. root in 1 cup boiling water. Take 1 cup per day. Overdose can cause vertigo (dizziness) and stuffiness in the chest. Experimentally, causes bloody diarrhea, painful gastroenteritis, cyanide-like poisoning. Research has shown that this plant is potentially toxic.